8 ) Usage: Developed to help fight breast cancer, Aromasin is one of the most powerful estrogen suppressing compounds. a. Aromasin is one of the most powerful estrogen suppressing compounds. b. Aromasin is one of the best compounds to lower the aromatizing effect of steroids. c . Aromasin is available for body builders taking anabolic steroids. d . Aromasin is also known as Exemestane. e It acts by blocking the enzyme aromatase, subsequently blocking the production of estrogen. f. Aromasin is also a kind of .antineoplastic (hormonal) raw materials. 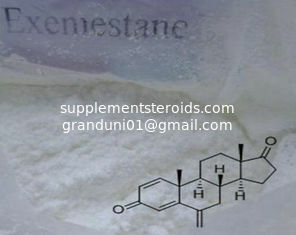 Exemestane,(trade name Aromasin) is a drug used to treat breast cancer. It is a member of the class of drugs known as aromatase inhibitors. Some breast cancers require estrogen to grow. Those cancers have estrogen receptors, and are called ER-positive. They may also be called estrogen-responsive, hormonally-responsive, or hormone-receptor-positive. Aromatase is an enzyme that synthesizes estrogen. Aromatase inhibitors block the synthesis of estrogen. This lowers the estrogen level, and slows the growth of cancers. Exemestane is an oral steroidal aromatase inhibitor that is used in ER-positive breast cancer in addition to surgery and/or radiation in post-menopausal women. The main source of estrogen is the ovaries in premenopausal women, while in post-menopausal women most of the body's estrogen is produced via the conversion of androgens into estrogen by the aromatase enzyme in the peripheral tissues (i.e. adipose tissue like that of the breast) and a number of sites in the brain. Estrogen is produced locally via the actions of the aromatase enzyme in these peripheral tissues where it acts locally. Any circulating estrogen in post-menopausal women as well as men is the result of estrogen escaping local metabolism and entering the circulatory system. 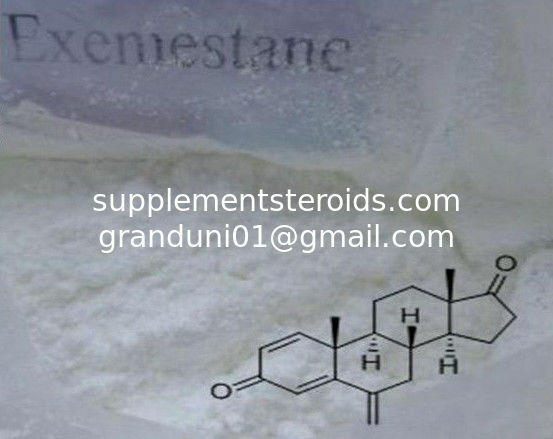 Exemestane is an irreversible, steroidal aromatase inactivator, structurally related to the natural substrate androstenedione. It acts as a false substrate for the aromatase enzyme, and is processed to an intermediate that binds irreversibly to the active site of the enzyme causing its inactivation, an effect also known as "suicide inhibition." By being structurally similar to enzyme targets, Exemestane permanently binds to the enzymes, preventing them from converting androgen into estrogen. Exemestane is taken in tablet form once a day. Patients can experience side effects like nausea, anxiety, shortness of breath, abdominal pain, bone pain, and chest pain. Side effects vary widely between patients and patients should report the side effects they experience to their doctors, as some may be indicators of dangerous complications. Shortness of breath and chest pain in particular are causes for concern in patients taking exemestane.